Yesterday, it was reported that Fulani herdsmen attacked 11 villages in Plateau state killing over 86 people and burnt about 50 houses, it appears that Bankyw and his movie crew members were caught in the riot that followed the attacks. 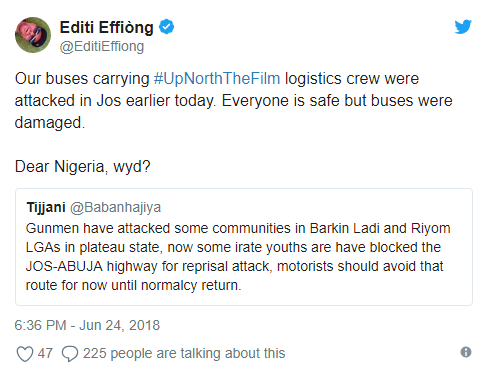 But we didn't know that crew members of a movie featuring Nigerian popular singer, Banky W and Kannywood actress, Rahama Sadau were also attacked in Plateau as they were there yesterday for a movie shoot. 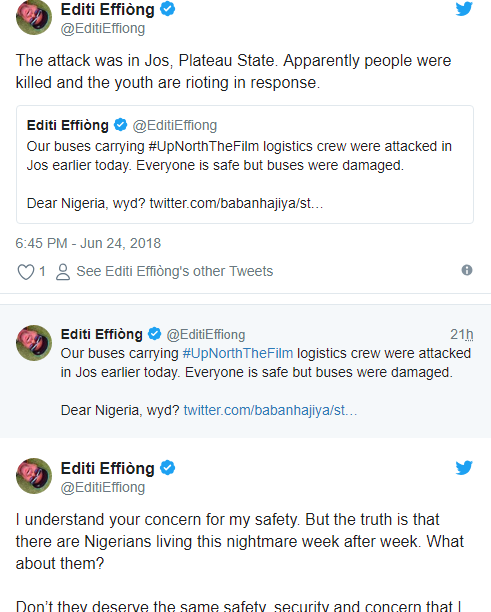 The executive director, Editi Effiong, of the upcoming movie 'Up North', a movie which stars Nigerian singer, Banky W, and Kannywood actress, Rahama Sadau, has disclosed to the public that the movie’s crew members were attacked in Jos, Plateau state. Plateau state governor, Simon Lalong has placed a dusk till dawn curfew in the affected areas. He also promised the people of the state that the perpetrators will be apprehended by security agencies.